Those of us sucker-punched with snow this weekend can take heart that the temperature has returned to a semblance of normal. New Yorkers two centuries ago were nowhere near as lucky. The year 1816 would be forever remembered by many names: The Poverty Year, Eighteen Hundred and Froze to Death, and most famously The Year without a Summer. It would be most known as the time when a perfect storm of low temperatures, a lull in solar activity and a supercolossal volcanic eruption caused one of the most tragic epidemics of famine and destruction in Western history. Those events of two centuries past still haunt us today—especially when human beings are altering the atmosphere more so than ever before. 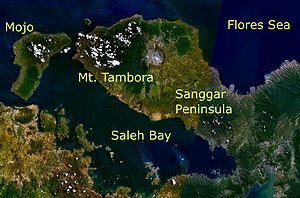 In April of 1815, Mount Tambora, on the island of Sumbawa in present-day Indonesia, erupted for approximately ten days. The explosion measured a 7, “or “supercolossal” on the Volcanic Explosivity Index—an intensity only seen about once in a millennium. Massive volumes of volcanic ash and dust spewed into the upper atmosphere. It could not have happened at a worse time. The atmospheric disturbance produced brown and red snows in Central and Southern Europe. The erratic, freezing summer temperatures led to crop failures, famine, epidemics and food riots from Shanghai to London. Yet the widest social and cultural effects were in the northeastern United States. In May of 1816, frost killed off the newly planted crops in New England, and the cold snap would grip the region by June. Snow—often of a foot or more—was reported from Quebec City to Pennsylvania between June and August. Ice floes could be seen as far south as the lower Susquehenna River. Temperatures would rise to normal summer temperatures and drop to below freezing within hours. In the winter of 1817, temperatures dropped to -26°F in New York, freezing the upper New York Bay solid. With the destruction of the New England harvest, grain prices rose dramatically. Oats, for example, went from $0.12 a bushel to $0.92 a bushel in one season. Corn, wheat and other grains also spiked in price, creating national food shortages, hoarding and price speculation. The most dramatic effect, however, was the actions of the survivors of 1816. Although the western expansion of the United States was in full swing even twenty years before, the 1816 disturbances began a mass exodus from New England. Thousands of now-destitute farm families picked up sticks and moved west, to upstate New York and the Northwest Territory, today the Upper Midwest of the country. Vermont alone dropped almost half its population after 1816. Two survivors of the Year without a Summer still affect us today. One of the families that left Vermont in 1816 were the Smiths. They moved from Sharon, Vermont to Palmyra, New York, where their son, Joseph, would engage in a series of events that would eventually lead to his founding of the Church of Jesus Christ of Latter-Day Saints. The other is definitely more apropos to today’s holiday. A group of friends had to spend their summer vacation in Switzerland indoors due to the bad weather. To pass the time, they started a contest to see who could write the scariest story. The host, the great poet Lord Byron, wrote a poem aptly titled Darkness. Another, John William Polidori wrote The Vampyre. Yet the clear winner of this contest, at least in the modern age, was a woman named Mary Shelley, who decided to pen a ditty with the second title of The Modern Prometheus. You know it better as Frankenstein. It is altogether fitting that we end with this story of freakish science gone horribly wrong. If 1816 came about due to natural phenomena, then can we expect something similar with our filthy mitts in the atmosphere? Will our meddling with the environment cause the next Year without a Summer?